Salon – an Artful Conversation was founded in 2011 by Judith HeartSong. It’s a lively, friendly conversation between participants and a gifted and knowledgeable presenter. Admission is free and open to creative professionals of all types and every career level. Participants traditionally bring light food and drinks to share, but there’s no expectation to do so. Judith’s goal is to bring together artists, writers, and arts professionals in one place on a monthly basis where they can feel a sense of community, learn more about the business of art, and build bonds with other like-minded professionals. Salon has been going strong for years and maintains a loyal following of creative professionals at every career level. 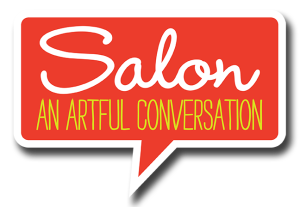 Salon – an Artful Conversation is an opportunity for creatives to network, learn and socialize in a relaxed, friendly atmosphere. Bring a friend, a colleague or just yourself. Just come prepared to learn, interact and network with other creatives. We highly recommend you bring a small stack of business cards! Judith continues to work to build community in metro DC and beyond, with salon expanding to the Torpedo Factory Art Center in Alexandria, Virginia. Learn more about artistic practice and the business of art from professionals with years of experience and wisdom to share. grow your business and your skills! Admission to Salon is free. You’re encouraged to bring your favorite food or beverage to share, curiosity of the arts and an appetite for learning. (NO RED wine please).